A black and white photograph of Lady Hamar Greenwood. Lady Hamar Greenwood (1886-1968) was born Margery Spencer in Herefordshire, England on December 20, 1886, daughter of Walter Spencer of Founhope Court, Herefordshire. She met Hamar Greenwood of Whitby, Ontario during an earthquake in Jamaica and married him at St. Margaret's Church, Westminster, London, England on May 25, 1911. Guests included British Prime Minister Hebert Asquith and Canadian Prime Minister Sir Wilfrid Laurier, who were attending the Imperial Conference. 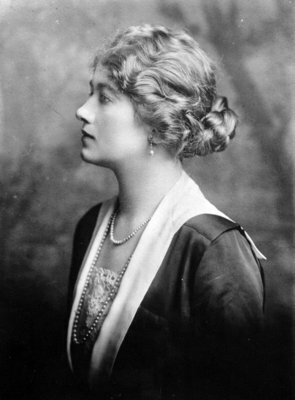 She was name Lady Greenwood in 1915 and Viscountess Greenwood in 1937. She received the C.B.E. in 1920 and the D.B.E. in 1922. Lady Greenwood was a good public speaker and was the first Chairman of the Women's Section of the Comrades of the Great War (later the British Legion). She was Chairman of the London Penny-a-Week Fund in 1941-1945 and the Ladies' Carlton Club, 1932-1937. Lady Greenwood died in London, Middlesex, England on April 24, 1968 and is buried in the Parish Cemetery at Codicote, Herefordshire, England. Lady Hamar Greenwood, c. 1915, Photographer Unknown. Whitby Archives 32-000-031.